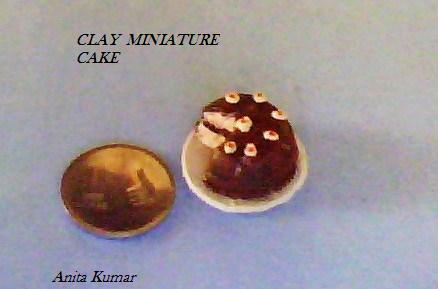 This is my maiden attempt at making miniature food. I have tried making a chocolate cake decorated with cream and cherries. Its quite easy and I made this out of a very small amount of leftover cold porcelain on the verge of turning hard. So the crumbly look is natural and I did not make it ! 1 Take a small ball of clay, mix little bit of brown and flatten it slightly. 2 Use a bottle cap or a small round cutter to cut out a round piece. Make two such pieces. 3 Scratch the surface of the two pieces and paint with deep brown to get chocolate color. 4 Stick on each other with glue.Paint choco color. 6 You will see the inner part with the choco layer. 7 Now make tiny white balls and stick with glue to decorate the cake. 8 Use a red sketch pen to put a dot , cherries on the cream . This is how I made this cake.Maybe if the cake is cut after the decoration then we can keep the piece of cake too. Will definitely give it a try. This time I had to cut the cake to see the inner picture and it was just the way it should be !